I was pleasantly surprised by the number of Indian style recipes in “The Art of Good Cooking.” This was the first one I tried from the book and to be honest, I was skeptical. I first experienced well made tasty Indian food in high school. I say “well made” because prior to this, my experience with Indian food consisted of overly spicy burning your entire mouth to the point that you can’t taste and might as well be eating canned dog food mixed with oil and heavy cream. 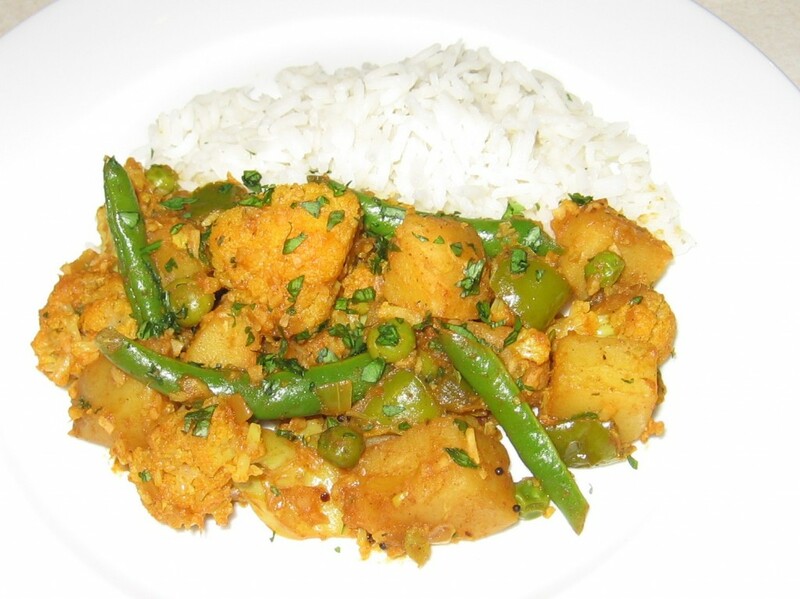 My stepmother introduced me to healthier, flavorful dishes, mostly of north Indian decent. This recipe uses curry powder which was more available than spices such as turmeric, cumin, and ground coriander that curry powder can (but not always) be essentially comprised of. A vegetarian dish that if served with rice and a side of Raita is easily a full satisfying meal. It has over 5 different vegetables which makes the dish more lively, and each one is easy to find and inexpenive. Like most curries, a fair number of ingredients are needed for this recipe. I find that each one creates a distinct layer of flavor within the dish that contributes to the overall highly spiced (but not necessarily hot and spicy-that’s up to you) multi-fascited profile. This is no boring dish. Heat oil in a deep pot over medium heat. Add mustard seeds. When seeds begin to pop, stir in green pepper, onions, garlic, serrano pepper if using and ginger, and saute until tender. Add curry powder, cayenne if using, salt, and pepper. Add cauliflower and diced potatoes and toss in spice mixture. Add stock and tomato sauce. Cover pot and simmer over medium low until potatoes and cauliflower are tender – add more stock if needed. Add green beans, then peas. Continue to cook until all vegetables are tender. Do not allow to dry out too much. Alternatively, you may turn up the heat at the end if there is too much liquid – there should not be too much sauce surrounding the vegetables. Add lemon juice. Adjust seasoning as necessary. Just before serving, sprinkle with chopped cilantro and shredded coconut. Serve with fluffy steamed basmati or jasmine rice and Raita.